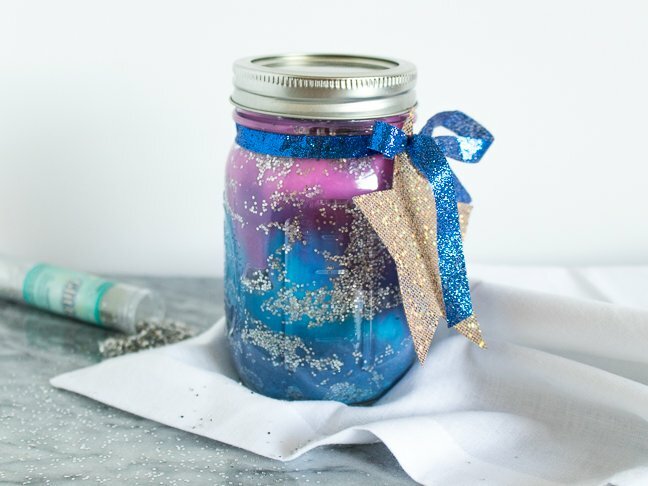 A galaxy jar (also known as a sensory jar, nebula jar or calm down jar) is an amazing project for kids who are interested in space or just want something pretty to make and share with their friends. 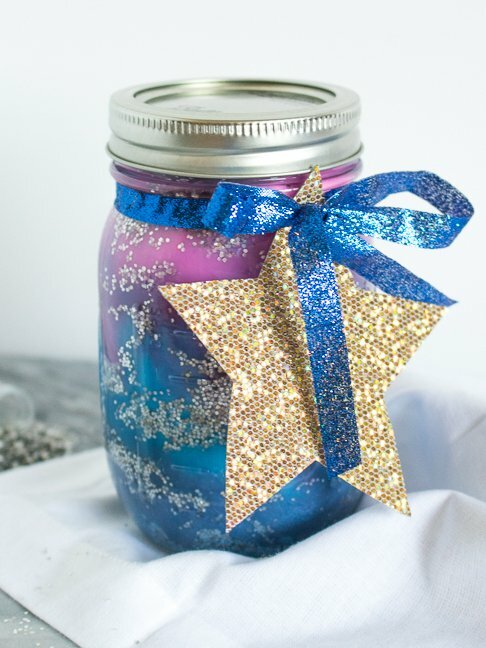 This quick DIY galaxy jar recreates the look of a colorful, starry galaxy with layers of cotton, paint, and glitter. 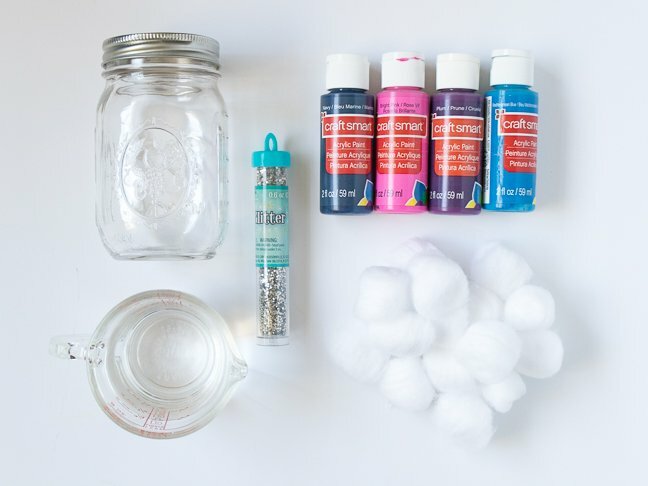 In less than 10 minutes, your kids can contain the look of the starry sky to a jar they can keep on their nightstand. Because it’s sort of magical, they have been known to also calm down anxious or fidgety kids. And let’s be honest, aren’t most kids anxious or fidgety at SOME point? You can decorate them and attach a tag with an inspirational word or quote, too. 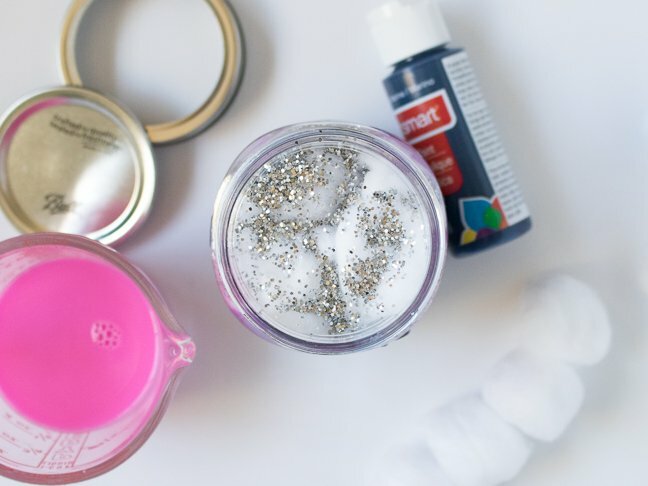 Have a kid who could benefit from making their own DIY galaxy jar with glitter, cotton, and paint? Follow my easy step-by-step instructions below. 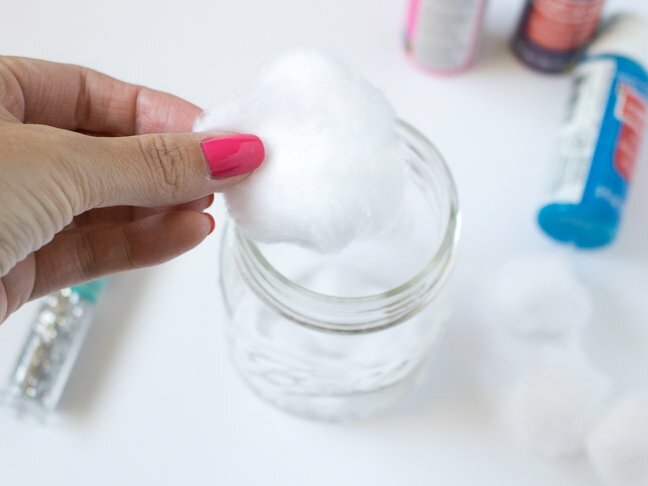 Step 1: Gently pull apart the cotton balls to expand them and add 3 or 4, depending on how big your jar is, to completely cover the bottom of it. Step 2: Sprinkle glitter generously over the cotton layer. 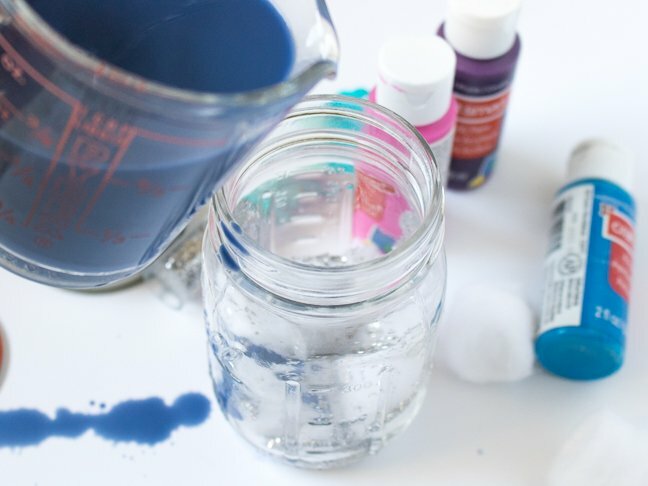 Step 3: In a separate cup, mix together about 1/3 cup of water with your darkest color of paint until desired color is reached. 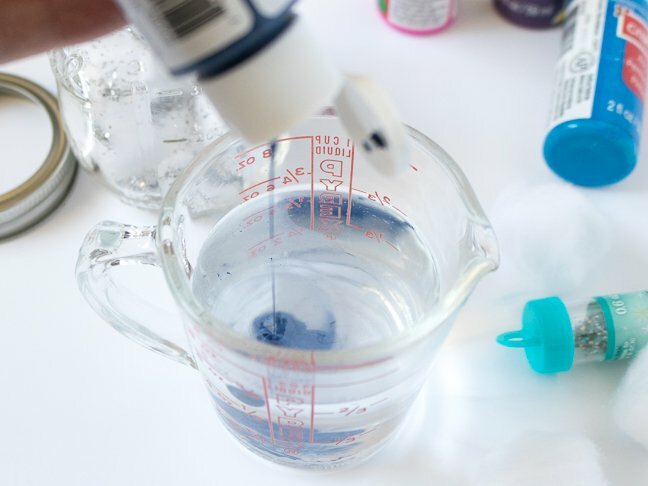 Carefully pour over the cotton balls until they are soaked with colored water. Step 4: Repeat with a layer of cotton balls and glitter, and mix the next color layer, followed by the layers of other colors, depending on how many colors you are using. 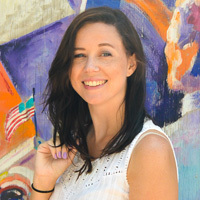 The colors will blend slightly, so there’s no need to be exact. 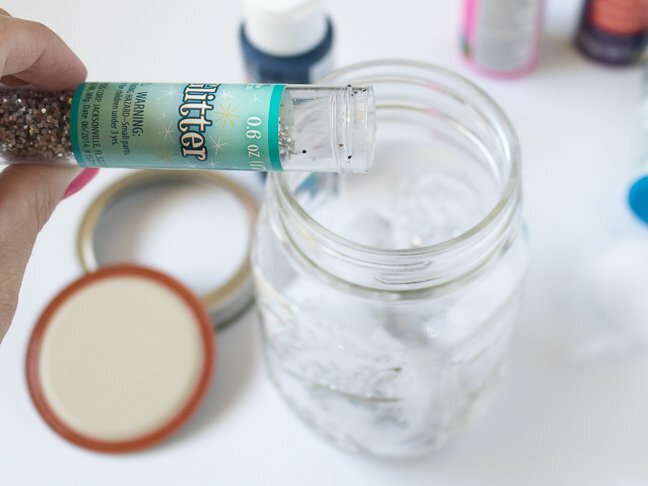 Step 5: When you reach the top, add a little more glitter or cotton as needed to complete the look of the “galaxy” and gently shake the jar if any cotton is still visible. Step 6: If you want, add a glittery star tag or a tag with a cute saying on it! This is perfect for sitting on the shelf or just as a quick project for any kid that loves the night sky.